A friend of mine works for this company called Tendril Networks in Boulder Colo. Check out the two photos below. 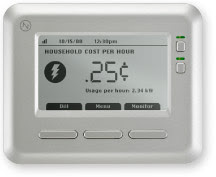 I need one of these up in the kids playroom so they can see exactly how much it costs to leave that light, computer, gamecube, or television on and running when they're not in the room! :-) I need one of these *TODAY*! This system sounds great! Where and when can i get this installed in my house???? I love this idea! Where can i buy this system? Will this be available this month? in the post for details!